Wow, how time has flown since Coveted has hit the shelves! I'm so excited to participate in another blog hop and I hope you'll enter my giveaway as I celebrate my first foreign release this week! If you haven't heard of Coveted yet, check out a 2 chapter excerpt to learn more about Natalya and her holiday hoarding obsession. Do you want to celebrate with me from May 21st to May 31st? As part of the Romance at Random's Diamond Jubilee Hop, I'm giving away five copies of Coveted! This giveaway is international! If you're a winner and you prefer an e-copy I can offer that as a Kindle or B&N gift. Just use the entry form below. The minimum entry is just a comment on the blog post. I'd love to know though, do you have a favorite author from outside the US? Share one of their recent titles! I love to discover new authors to read. If you don't have one, that's okay! Why not share what you plan to read or do this week for fun! Additional tidbit: If you're an aspiring author, be sure to check out the Writer's Digest presentation given by my literary agent Jim McCarthy next week: 10 Elements of the Saleable Novel. Thanks for the giveway, I've been wanting to read this! Not many, but I do love Kelley Armstrong (who's Canadian). Thanks! This week I plan on finishing at least one of the many books I currently have started!! Portia da Costa writes great romances. She lives in the UK. Coveted sounds like a great story. Thanks for the giveaway! Thanks for the giveaway! My favorite non-U.S. author is probably Philip Pullman of the Golden Compass series. This book sounds great. Thanks for the giveaway. 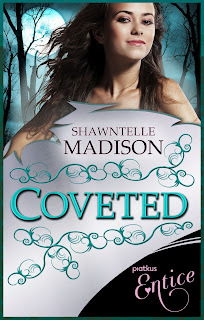 I really looking forward to reading Coveted, thanks for the chance to win a copy. I love JK Rowling's books, and she's from the UK. J.K. Rowling is my favorite non-US author. Congrats on your foreign release!! My son likes Pittacus Lore who wrote I Am Number Four and The Power of Six. I am just getting into urban fantasy; historical has always been my favorite genre 'til now. Thanks for the chance to explore further with your book. Congrats on your first foreign release! My favorite authors include P. G. Wodehouse (Jeeves stories) and Terry Pratchett (Discworld series). Neither are romance writers although there are romances in the stories themselves.